Save an extra CDN$ 6.80 (33%). Buy the Kindle Edition instead. Monkey Beach combines both joy and tragedy in a harrowing yet restrained story of grief and survival, and of a family on the edge of heartbreak. In the first English-language novel to be published by a Haisla writer, Eden Robinson offers a rich celebration of life in the Native settlement of Kitamaat, on the coast of British Columbia. The story grips the reader from the beginning. It is the morning after the narrator’s brother has gone missing at sea; the mood is tense in the family house, as speculations remain unspoken. Jimmy is a prospective Olympic swimmer, seventeen years old and on the edge of proposing to his beautiful girlfriend Karaoke. As his elder sister, Lisa, faces possible disaster, she chain-smokes and drifts into thoughts of their lives so far. She recalls the time when she and Jimmy saw the sasquatch, or b’gwus – and this sighting introduces the novel's fascinating undercurrent of characters from the spirit world. These ghostly presences may strike the reader as mysterious or frightening, but they provide Lisa with guidance through a difficult coming of age. We watch Lisa leave her teenage years behind as she waits for news of her younger brother. She reflects on the many rich episodes of their lives – so many of which take place around the water, reminding us of the news she fears, and revealing the menacing power of nature. But Lisa has a special recourse – a “gift” that enables her to see and hear spirits, and ask for their help. Monkey Beach, Eden Robinson’s first novel, was nominated for Canada’s two largest literary prizes: the Giller Prize and the Governor General’s Literary Award. The book was also published in Great Britain, the United States and Germany, and was a Canadian bestseller for many weeks. Monkey Beach is beautifully written, in prose that is simple and subtle, bold and vivid, and pervaded by humour. Start reading Monkey Beach on your Kindle in under a minute. Lisamarie Hill, the protagonist of Eden Robinson's coming-of-age novel Monkey Beach, is a terror. She'll run out of an evacuating car to get a better view of a tidal wave. She'll drag you unconscious to a deserted island with nothing but cigarettes, marshmallows, and the need to get you talking. Whatever her age, she'll ask awkward questions. Set in the coastal Haisla village of Kitamaat near British Columbia's dauntingly gorgeous Queen Charlotte Islands, Monkey Beach is the story of Lisa and her Haisla community, including uncles involved in First Nations warrior movements, industrious grandmothers with one foot in the grave and the other in various spirit worlds, and the long-armed specter of residential schools. The path to adulthood (and you risk a bloody nose if you call Lisa an adult) for Lisa and her friends is beset by the dangers of substance abuse and family violence but sprinkled with hopes as varied as Olympic gold or, sadly, a "really great truck." "A graceful and impressive book." "Far more than a novel of psychological transformation... It is, in the best sense, a thriller, a spiritual mystery... breathtaking... Robinson rewards our faith that after all these years writers can still, as Pound said, 'make it new.' In this year's lineup of lookalike literary prospects she could be the Willie Mays we've been hoping for." "Glorious Northern Gothic... . A compelling story...Robinson has an artist's eye, and delicately evokes the astonishing natural beauty of the Kitamaat region...behind Lisa's neutral voice is an authorial presence, weaving Haisla and Heiltsuk lore into the fabric of the novel gracefully, but with the quiet determination of an archivist cataloguing a disappearing way of life... a deeply satisfying conclusion." "Monkey Beach is a moody, powerful novel full of memorable characters. Reading it was like entering a pool of emerald water to discover a haunted world shivering with loss and love, regret and sorrow, where the spirit world is as real as the human. I was sucked into it with the very first sentence and when I left, it was with a feeling of immense reluctance." "Remarkable...Reads like a friend's conversation over coffee — warm, genuine...The simple, straight-to-the-heart prose gives each element, each event in the story, the same weight and perception of reality...Monkey Beach is both unusual and memorable...The book is a work of a deft talent, all the more remarkable that it is a first work." "Although death hangs like a Pacific mist over these pages, Robinson, herself a Haisla, fills this edifying book with the stuff of the living, from the tiniest details of Haisla life to the mightiest universals of tradition, desire and family love." 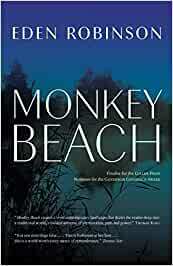 "Monkey Beach...is written with poise, intelligence and playfulness... Intricately patterned... there is much to admire in this tale of grief and survival...In Lisamarie Hill, Robinson has created a memorable character, a young woman who finds a way to survive even as everything around her decays." "...we bear witness as she spreads her wings — not one note rings false. All the characters...are stubbornly real, mixtures of good and evil. This is Robinson at her best...this is a world worth every ounce of remembrance." "A whirling magical style." "Native writer's debut novel catalogues the touch, sound and taste of Haisla life." "A first novel that bristles with energy — and a spunky heroine.... A haunting coming-of-age story [whose] the tragic elements are leavened with wonderful moments of humour...The characters in the book emerge brilliantly." "[Robinson's] command of language and ability to create three-dimensional, believable characters result in a hypnotic, heady sensory experience —. The beauty of the book is in the details —Robinson combines mortal and spiritual worlds, the past and the present, seamlessly fusing them into a cogent, non-linear narrative —. Riveting." "Robinson...cuts through the superficial and goes straight to the heart." "Robinson's specialty is presenting the day-to-day: no bells, no whistles, no filtered lenses...but a lot of close-ups... The humour is pure, but the grit and blood is mixed with meditations on still waters, ancestral voices, ghostly footsteps and beating hearts...[Monkey Beach is] an important work of understanding." "Traplines was acclaimed for its startling blend of reality, brutality and humour — Monkey Beach carries [Robinson's] signature. But it does more. The dark humour is still pure, but the grit and blood is now mixed with meditations on still waters, ancestral voices, ghostly footsteps and beating hearts." "Eden Robinson taps her own Haisla-Heiltsuk heritage to hurl [our Native] stereotypes into the West Coast mist and cigarette fumes that drift through her story. Her heroine, Lisamarie, is fierce and funny and screwed up, [and] her story, told through her memories of a past both rich and troubled, reveals a woman as strong and intricate as a carved mask." "Monkey Beach is an important novel. It exposes the redemptive, vital lives of a once dying culture with Robinson's insider compassion and trickster wit—. Robinson has energy; she resists the slickster sophistication that dries out so much of today's fiction; her humour is not urbane and nasty but shifty and wise." "Robinson's characters are refreshingly real, simply yet elegantly wrought"
"Monkey Beach is a gift." "Monkey Beach...is pervaded by a powerful sense of menace, and the haunting spirituality that lurks in the beautiful landscape of Canada's Pacific coast." "Fans of Robinson's bleak, compelling shorts won't be disappointed." "Beautifully written and haunting, this is an impressive debut." "Her debut novel is an absorbing, if at times, disturbing, imaginative work." "In her debut novel, Monkey Beach, Eden Robinson, a young First Nations woman who grew up in Haisla territory near Kitimat BC, does not wring her hands or cast blame. This is a candid and contemporary tale of family love and societal screw-ups and she simply acknowledges the reality of an unfolding universe." "Well worth reading...a complicated fabric of disaster and redemption." "A gripping read... Smart, lyrical, simple prose, dramatic and affecting... Her truths, like her heroine, are young, raw, stark...Nature is evoked so vividly that chronology seems almost artifice. You see the seasons through Lisa's eyes, as if they are calendars and clocks, until place becomes time, and you understand the world that was lost." "A wonderful read...Lyrical but straightforward, enchanting... ultimately, redemptive." You can often tell a lot about a novel by its chapter or part headings. I had a good feeling about Eden Robinson’s “Monkey Beach” when I read the names of the four parts: Love Like the Ocean, The Song of Your Breath, In Search of the Elusive Sasquatch, The Land of the Dead. It sounded like very much my kind of novel, although I have been misled along these lines more than once. “Monkey Beach” delivered on my expectations. It is the story of a native community, in B.C.s Coastal Mountains, told from the perspective of teenager Lisamarie. Ostensibly, the driving force of the novel is the disappearance at sea of handsome and popular Jimmy, Lisamarie’s 17 year old brother, and the search to find him. But in truth, that storyline is really only a backdrop. This is Lisamarie’s story. Rebellious and an outsider, she struggles to come to terms with the dark secret of her ability to see and communicate with spirits. Along the way, we are gifted with rich detail about native culture, in particular Haisla lore, including the nature of spirits. We are also tempted by tales of the legendary sasquatch who are known to inhabit Monkey Beach where Lisamarie is drawn in the search for her brother. The pain of loss and the inability to fit in ring throughout “Monkey Beach”. Ultimately, the novel is about the struggle to come to terms with these emotions and to find one’s place within them. It is a story told many times before but enriched in “Monkey Beach” by the detailed overlay of native culture. Beautifully written, a wonderful engagement things like Aboriginal traditions and life style, coming of age, myths and beliefs, love and family. A different way at looking at problems in Aborginal communities (effects of residential schools, sexual abuse) without making them the them central to the book. Extremely slow to start. Half way through the book and still don't know where it's going or what is happening. Lots of back and forth between time periods makes story line confusing to follow at times. This was a fantastic read! An original Aboriginal gothic story. Insight into the beautiful, scary, spiritual and physical journey of an Indigenous girl trying to find her brother lost at sea and what it means to be Haisla woman. I think this book is important to west coast indigenous history and draws on such intimacy that you won't forget it. Monkey Beach is really good. Especially the quality it came in was incredible. I really connected to the novel even though I am not native or know the native religion. I believe that anyone can fall for the novel if they keep reading none stop, sometimes it is confusing, but it's easy to understand the literature if you have a low vocabulary spend (like me). Anyone could read this and I really recommend reading this! Probably the best book our book club has ever discussed. An amazing portrait of reserve life in semi-remote British Columbia. The characters in this book jumped off the page - beautiful, evocative of the BC coast, full of mystery and intrigue and spirits..I couldn't put it down, and as soon as I did I wanted to read it again.